The owners of Ballylehaun House in Gathabawn, Co Kilkenny, never had to wait until the cows came home – the animals were already in situ when they bought the 300-year-old property. The original property dates back to the 18th century when it was a home for the manager of a larger house on the land that was later destroyed in the Civil War. Ballylehaun started off as a single-storey cottage and had bits added on over the years. It was in a sorry state when the current owners took it on in the 1990s but they enjoyed the challenge that lay ahead. The only original feature left in the property is the fireplace in the kitchen. It was when tearing the walls down that the vendors found it hidden behind pebble dash and ‘nasty’ rendering. The heavy work was done in those early days, but in 2010 the vendors extended into the barn to create a huge kitchen, with plenty of space still left in the barn if new owners want to expand further. The rest of the barn and stables could convert, subject to planning permission, to a large home office or workshop, or there is enough space for more bedrooms with Airbnb potential. The living accommodation measures over 3,000 sq ft. A tree-lined driveway brings you to the front of the house, which is hidden from the road and feels very secluded. To the right of the hall is the dining room, with its exposed cut stone wall. It leads into the impressive sitting room with its sash windows and French doors that open out to a sun deck. In the centre of the room is a cut-stone chimney breast with flagstone hearth and railway sleeper mantelpiece. On the other side of the hall is a small living room and adjoining bathroom that could be used as a bedroom with en suite. Beside this is the kitchen with a double-height ceiling (15ft) and the original fireplace standing proud on the back wall. There are bespoke applewood fitted units with a matching island and breakfast counter. The integrated oven and dishwasher are included in the sale. An open staircase leads to a mezzanine with Velux window and spot-lighting that overlooks the kitchen. An adjoining utility room has more units, is plumbed for a washing machine and has access to the back garden, as well as the garage. Upstairs are three bedrooms, two of them en suite and one with a cast iron fireplace. A real surprise feature is the sunken bath in the main bathroom. The wall and floor tiles blend into each other, with the bath ‘hidden’ in the corner. There is also a shower unit if you don’t have time to linger in the bubbles. The house comes with 5.56 acres, which, coupled with the stables, could make it very attractive to horse lovers. Mature lawns surround the property and can be accessed from many doors in the house. There is a stone water well, water fountain, garden ponds and sun decks around the gardens. The house is 2km outside Gathabawn village which has a shop, Mackey’s Bar, a church and a primary school. Durrow is only 6km away so if any potential buyers were considering opening a guesthouse, subject to the necessary permissions, there is a good chance they would be in the market for a spill-over of guests from the popular wedding venue, Castle Durrow. Kilkenny city is a 25-minute drive from the property and is packed with decent pubs and restaurants, like the Michelin-starred Campagne. Ballylehaun is three minutes away from the M8, making a commute to the capital possible in about 90 minutes. There is good broadband in the area so it could appeal to workers who don’t have to be in the office every day. 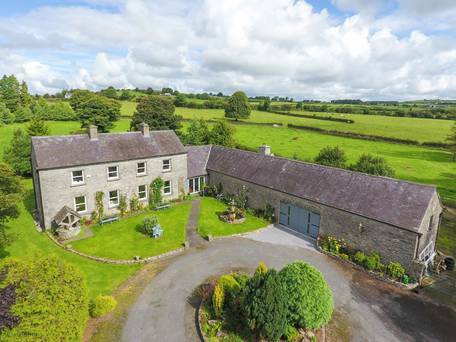 Ballylehaun House is on the market with a guide price of €495,000 through agents Sherry FitzGerald McCreery in Kilkenny, (056) 7721904.